An EPiC Art Experience: James Turrell's "Aten Reign"
On the summer solstice, EPiC had the pleasure of hearing James Turrell, one of the most interesting artists of our time (and perhaps funniest too -"art is not such a big deal, it's not even rock and roll! "), speak about his newest light installation, Aten Reign, and view it at the Solomon R. Guggenheim in New York. Aten Reign is the centerpiece of the Guggenheim's exhibition, which is a part of a three museum retrospective on the 70 year old artist's career (the two other venues being the Los Angeles County Museum of Art and the Museum of Fine Arts in Houston). The temporary installation is the largest to date for both the artist and the Guggenheim-- it takes over Frank Lloyd Wright's entire iconic rotunda with light that moves "seductively and seamlessly across the color spectrum." 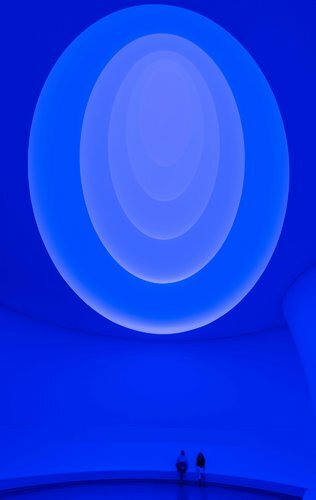 James Turrell (b. 1947) emerged as an artist in the 1960s as part of the "light and space movement" in Southern California. What has set Turrell apart from his contemporaries, is where other artists used objects with light, Turrell only used light--no object, image, or focal point. His largest project, which he has been working on since 1972, is the Roden Crater -- a natural cinder volcano situated on the southwestern edge of the Painted Desert in Arizona, which he has been transforming into a large-scale artwork with chambers, tunnels, pathways, and openings to observe the sky change, the passage of time, and the stars and planets. In a sense, it's a large-scale version of his "skyspace" series of "framed experiences" or small chambers with large openings to the sky, and walls lined with tilted benches for viewing. He has around 80 skyspaces all over the world. In his talk, Turrell made the comparison of the way people "enter" literature to how they view art. He described how when we read a book, it's easy to get lost in the story and not notice the passerby or anything going on around us. When we look at art in a museum, it's a quick once over and then on to the next. To add to this, I must mention how much Smartphones have changed the way we view art--half of our experience now is capturing the work on our camera phones and putting it on social media sites. I know that I am guilty of this and I consider myself an art person! Thus, when I went to view Aten Reign, I took Turrell's challenge and submitted myself to the work and "indulged" in the light. When I left the Guggenheim and viewed my photos, I immediately could tell that they did the work no justice and I felt silly (and guilty!) for even trying. Aten Reign is truly "a collaboration with the viewer" and must be experienced in real time and space as the artist intended. It's an EPiC art experience that cannot be missed this summer! I already cannot wait to go back again before it closes on September 25th. Hurry, get there quick! For more information on Aten Reign and the exhibition James Turrell, please click here.